What is not clear from the order is that 26 of the 41 men still imprisoned are also still subject to PRBs, although lawyers for the men still held do not believe that, under Trump, the process offers genuine hope that any of them will be approved for release — in large part because of Trump’s own assertions that no one should be released from the prison. 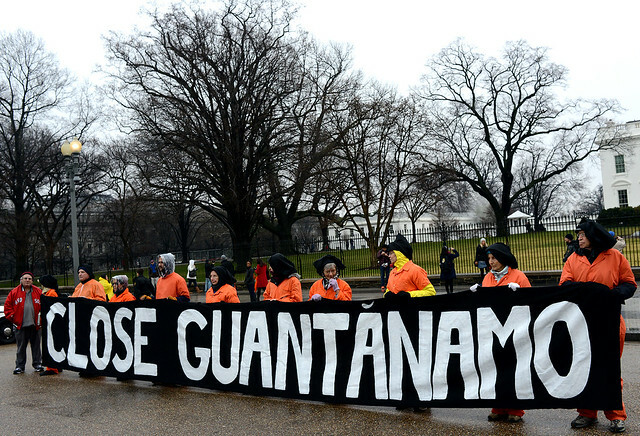 Also of concern are the five men still held who were approved for release under Obama — three by the Guantánamo Review Task Force of 2009, and two by the PRBs — and as a result lawyers for eleven of the men still held filed a habeas corpus lawsuit three weeks ago asking the government to justify its detention policy, and accusing Trump of being engaged in arbitrary detention. In response, District Judge Colleen Kollar-Kotelly recently set a deadline of February 16 for the government to respond. This entry was posted in All Posts News Politics and-or Videos, Dandelion Salad Videos, Gitmo, Human Rights, Imperialism, Prisons, Torture and tagged Andy Worthington, Barack Obama, Carl Dix, Donald Trump, George W. Bush, Indefinite Detention, Perpetual War, Same As It Ever Was. Bookmark the permalink. ← Lawrence Wilkerson: An Invasion of Iran Could Be Significantly Worse for the US Empire + Has Trump Launched a New Nuclear Arms Race?